About 100 members of the Occupy movement for a short time occupied Minnesota Governor Mark Dayton”s waiting room this afternoon. Capitol security and state troopers ushered the group back out into the hall in front of the Governor’s office. “Money for people not for stadiums” chanted the group. Referring to Governor Dayton’s current focus on public funding for a Vikings football stadium. 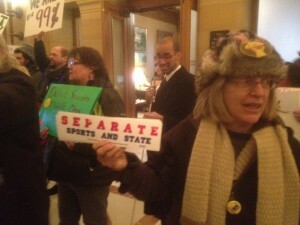 Troopers closed the doors to the Governor’s office after the protesters were ushered out. No one was arrested. The Governor had just completed a news conference where the press peppered him with questions about a potential stadium deal. Tomorrow he is scheduled to meet with Minneapolis Mayor R.T. Rybak and Vikings owner Zygi Wilf.